Thousands gather outside army headquarters in Khartoum despite a nighttime curfew imposed after al-Bashir's removal. udan's President Omar al-Bashir has been removed by the military after months of anti-government protests against his three-decade rule. 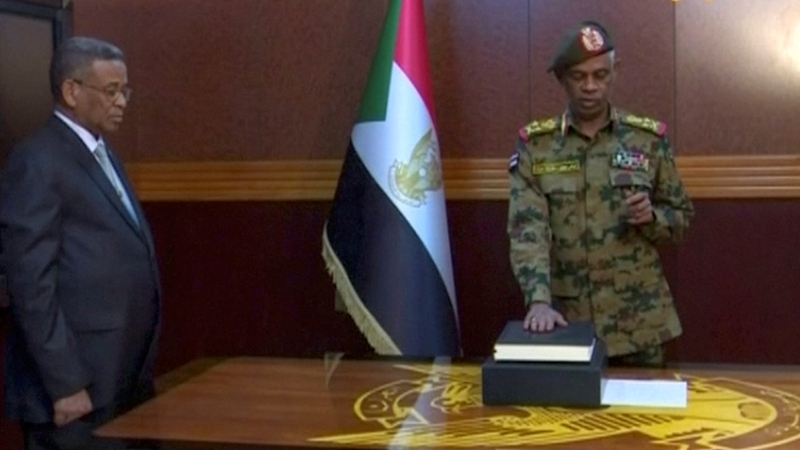 General Ahmed Ibn Auf was sworn in on Thursday evening as chief of a new military council that will rule the country for two years, hours after declaring that Sudan's long-time ruler had been overthrown and arrested. Since December, Sudan has witnessed persistent protests sparked by rising food prices that quickly escalated into wider calls for al-Bashir's departure. 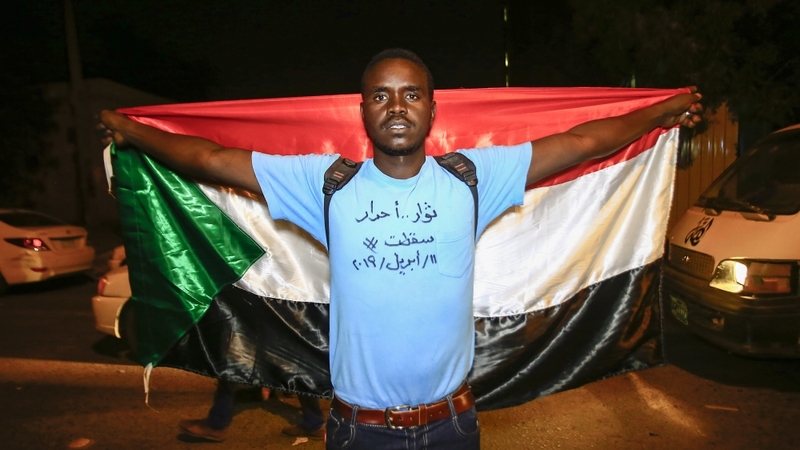 The Sudanese Professionals Association (SPA), one of the groups at the forefront of the demonstrations, calls on "all the revolutionaries" to continue their sit-in outside the army headquarters in Khartoum. "Stay there and secure the barricades and prepare for Friday prayers and prayers for the absent," it says in a Twitter post. Omer Eldigair, the leader of the Sudanese Congress party, rejects the military's statement. 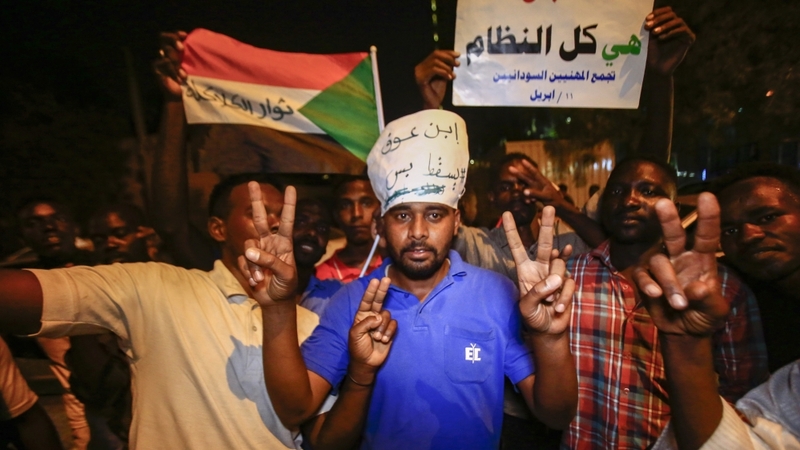 Thousands of demonstrators in Sudan's capital remain outside the army headquarters in defiance of a curfew (10pm-4am) announced earlier by the military. Al Jazeera's Hiba Morgan, reporting from Khartoum, says: "People are still in front of the army headquarters although an announcement has been made on state television by the interim military council, which is currently running the country, that the curfew has effectively been put in place and that people should leave the army headquarters and go back to their homes." Protesters are chanting their slogan "peace! justice! freedom!" as they continue their sit-in for a sixth consecutive night, according to AFP news agency. Sudan's state television says Ibn Auf has been sworn in as chief of the new military council that replaced al-Bashir. Lieutenant General Kamal Abdel Marouf is appointed as his deputy. Footage shows both men taking the oath in the presence of the chief of the country's judiciary. "We will not accept half victory. We need the whole and complete victory as anticipated and wanted by our martyrs. Thus, the Declaration for Freedom and Change decided to continue the sit-in in front of the General Command's headquarters," he says in Khartoum. Federica Mogherini, EU diplomatic chief, is urging Sudan's army to quickly hand over power to a civilian government. "Only a credible and inclusive political process can meet the aspirations of the Sudanese people and lead to the political and economic reforms the country needs," Mogherini says in a statement. "That can only be achieved through a swift handover to a civilian transitional government," she adds. "The Sudanese people should determine who leads them in their future," says Robert Palladino, spokesman for the Department of State. "The Sudanese people have been clear that they have been demanding a civilian-led transition. They should be allowed to do so sooner than two years from now." Read the English translation of the Arabic statement delivered by Ibn Auf's on al-Bashir's overthrow and arrest. It was the man named by al-Bashir as his deputy just six weeks ago who broke the news to the Sudanese people of the longtime ruler's removal. Sudan's army warns it will enforce a night-time curfew, state media reports, as protesters vowed to continue demonstrating against a military council set up after al-Bashir's removal. The curfew runs "from 10:00 pm to 4:00 am, and all must adhere to it for their own safety," the army says in a statement carried by the official SUNA news agency. It adds it is "doing its duty to keep them [Sudanese people] and their properties secure".